The sand-cast pieces explore artmaking as coordinated action and event. Original forms are generated by engaging the production process itself rather than committing it to a preconceived pattern. like density that can withstand the 2300 degree liquid metals poured into them. 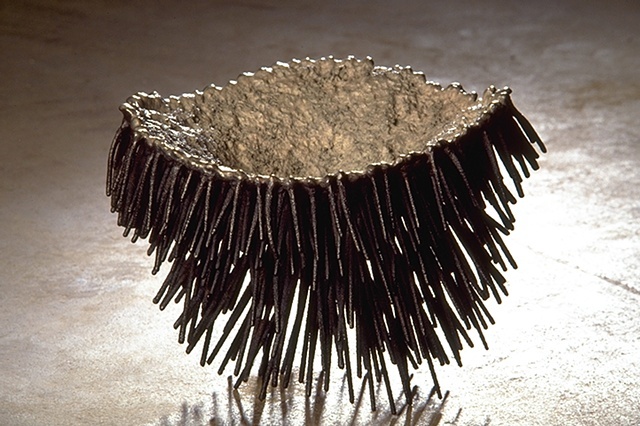 Urchin is the inverse of a fresh undisturbed pile of resin-bonded sand, and the spines are the result of a long drill bit bored radially and blindly into the cured lower mold section. The mold is closed, a pour column is attached and the molten metal drops briskly down the column, filling the bowl and down the length of the spines where it freezes. The piece takes its form directly from the temperature, pressure and flow volume in the act of pouring.